Dave puts the Therm-a-Rest sleeping bag and mattress combo through it’s paces to see if he can get a good night’s sleep. 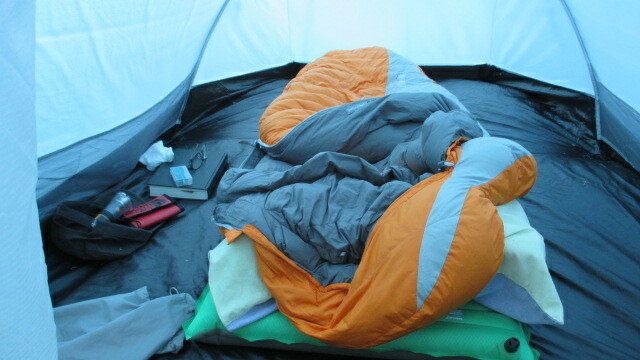 A three-season sleeping bag should handle it all – from late-season snowstorms to early frosts. During the spring and summer I do quite a bit of camping, this year I’ve been supervising Duke of Edinburgh expeditions back to back and so have spent more than enough nights under canvas. My dirty secret amongst CGR testers is that I like a little bit of backpacking and bivvying and will often choose a bivvi over a night in a stuffy Alpine hut. Sleep, however, poses a problem for me: I run hot but sleep cold so I like to be warm and will often wake up cold during the night, so it was great to test out the new Therm-a-Rest Antares 15F/-9C three season down bag. I’ve spend over twenty nights in it this season so far and it kept me warm and toasty throughout. The bag won an OutDoor Industry Award in 2013, this is an award given at the major European Outdoor Trade Fair in Freidrichshafen, Germany. So I was keen to test it. 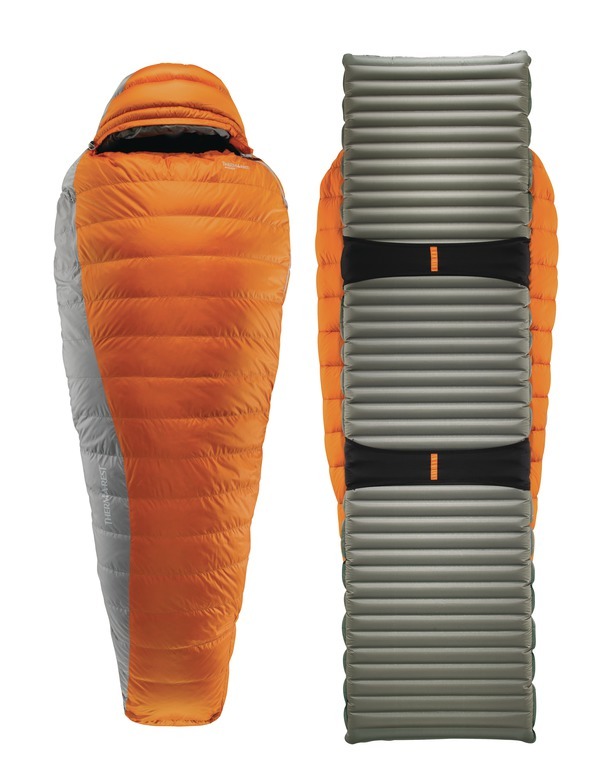 The Therm-a-Rest Anatres 15F/-9C Sleeping bag was warm and cosy. The sleeping bag is box baffle construction and has a great loft. I tested a regular size and found the bag very roomy with plenty of room to move around inside when asleep without getting twisted. The rating is for the bag is -9ºC (or 15ºF if you’re American) so is plenty warm enough for most three season adventures. On test I found it nice and toasty in all conditions and the loft was great. I slept in it for a full 10 days at 1600 metres and constant 4C mornings and most nights I was a little too warm! The Anates bag worked really well with the NeoAir All Season. The design of the Therm-a-Rest Antares 15F/-9C is a mummy shaped bag with a great hood. The hood shape fitted perfectly around my head in spring conditions when I needed a little extra warmth around my head. The bag is super warm with 750+ fill power and you can really notice that there is a lot of down around you. This extra down comes from the back of the bag, which is just a strip of fabric so it’s very important to use the bag with the SynergyLink loops and a mattress. The bag also has a unique SynergyLink system that is two elasticated and sewn loops. You basically slide an insulated mat into the two loops and it is held in position. This keeps the fabric layer against the mat which is very important because if you don’t you will get a cold back when you turn over in the night. The SynergyLink system worked very well with the Therm-a-Rest NeoAir All Season mattress as the extra thickness of the mattress locked into loops and kept the sleeping back perfectly in position. The Therm-a-rest NeoAir All Season was plenty big enough for my frame. I also own a Therm-a-rest ProLite Plus mattress and this also worked well but the shorter length meant my feet got a little cold. This was easily solved by using my pack to put under my feet which is what I do with any other bag when using the ProLite. In fact I’ve also recently used it with a huge base camp mattress and it worked perfectly, it locked the bag in position and I was able to toss and turn very easily just like under a duvet in bed. No more getting tangled up in the night. The NeoAir Mini Pump is a brilliant invention. I did find putting the bag into the SynergyLink loops a little fiddly when inside my tiny MSR Carbon Reflex tent, especially when it was wet and I needed to be in the tent. I’m often sleeping alone when I’m training, supervising or assessing and so use a one person tent when on expedition and I found that the SynergyLink system works better in a bigger, open tent spaces as you need a little room to fix the system in place. It did work but just took a little more creativity in a cramped space. All the zips worked really well on the Therm-a-Rest Antares 15F/-9C sleeping bag and at no time did they snag – important when you’ve stayed in the bag for as long as possible and the rush to finally answer the call of nature! I often use a climbing huts during the colder months and I found that using the Therm-a-Rest Antares sleeping bag without a mat in the loops created a cold strip along my back – so as I said earlier it’s really designed to be used with the SynergyLink loops and a mattress. This, I feel, restricts the versatility of the bag for those who want a sleeping bag for uses outside of camping. New developments for 2015 include the option of Nikwax Hydrophobic down in the form of the Antares HD which should be great for open air or tarp camping. 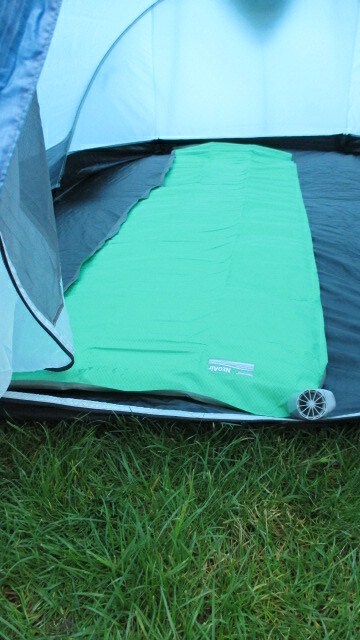 The Therm-a-Rest NeoAir All Season sleeping mattress was an excellent piece of kit. I’ve used a NeoAir XLite mattress since they came out several years ago and love the compact nature. I’ve never been cold when I’ve used one. If you have any doubts about the effectiveness of this air based mattress system then let me dispel them. 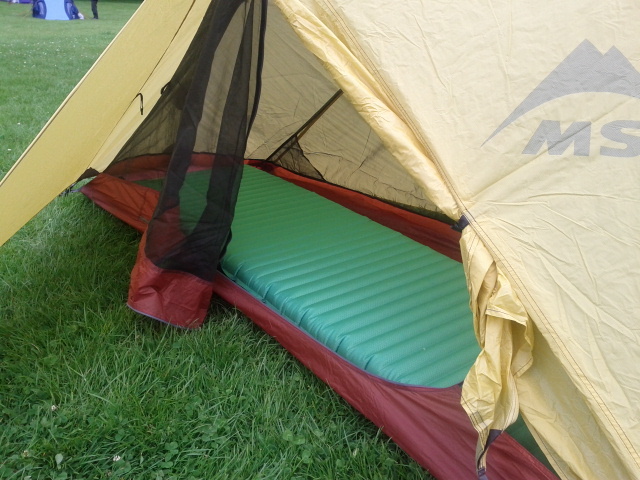 The packability is supreme, the NeoAir All Season mattress folds down really small and takes up no more room that a hardshell so no need to have your sleeping mat outside your pack. The Therm-a-rest Mini Pump works off 2 AAA batteries. They do take a little effort to blow up so Therm-a-Rest have come up with the brilliant NeoAir Mini Pump. This works with all Threm-a-Rest nozzles (so you could use it help inflate the huge Mondoking) and you will really feel the benefit as you pop the Mini Pump over the nozzle using the rubber tube and then get on with other tasks. It takes up very little room in the pack and with a couple of AAA Lithium batteries weighs no more than 65g. Just unfold the nozzle and it comes on, fold it back and it shuts off – nice and simple. I probably wouldn’t take it on an Alpine bivvi but for base camp and backpacking I definitely would as it saves a lot of effort. It has no automatic cut off so you’ll need to keep an eye on it. It’s a great little invention and solves the issue of time consuming inflation. 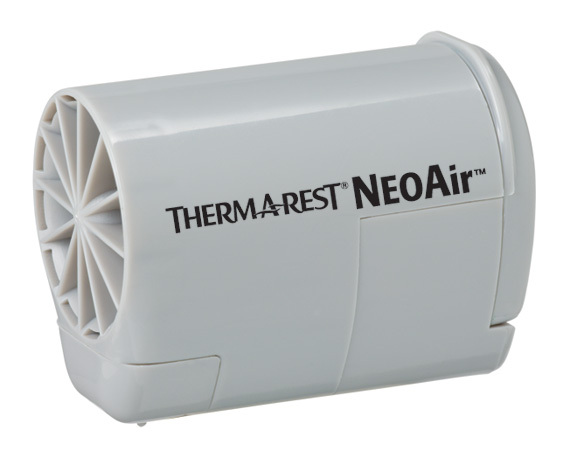 It comes included with the NeoAir All season as well as a handy repair kit. The Therm-a-Rest NeoAir All Season filled my MSR tent. The width has been just right for my medium frame and I could happily toss and turn and not fall off it. It was also important to fully inflate the mattress as it can be little noisy when you move on it if you don’t. All in all I feel the combination of the Therm-a-Rest Antares 15F/-9C sleeping bag and the Therm-a-Rest NeoAir All Season mattress has been very good when used in the SynergyLink combination. 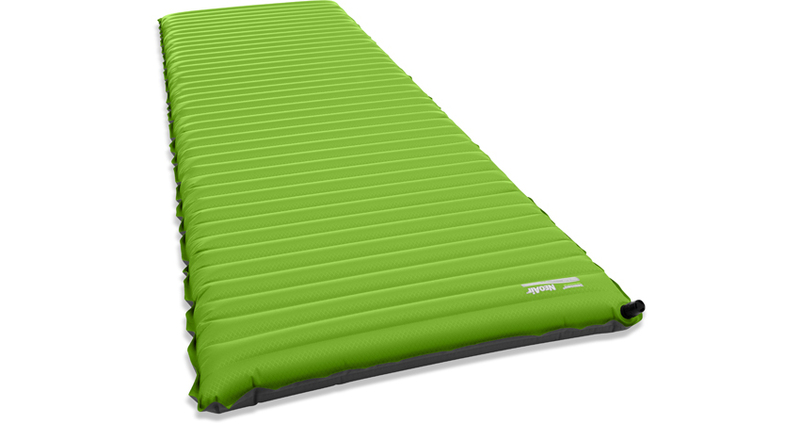 It makes for a very warm, light and packable sleeping system that is great for backpacking and climbing basecamp adventures. The addition of the NeoAir Mini Pump (included with the mattress) is a great extra that really will save you some time and effort. For an alpine base bivvi just substitute the all season mat for a Prolite Plus (which is what I do) and for an on route bivvi for the great Z Lite matress (cut down to ¾ to save even more weight and space). The Therm-a-Rest Anatres 15F/-9C sleeping bag comes in sizes Regular and Long and the NeoAir All Season comes on Medium, Regular and Long.